The average Hudson Valley homeowner spends 90% of their time indoors – at home, at school, and at work. According to the EPA, the quality of indoor air can be two to five times (and even as much as 100 times) more polluted than outside air, making indoor air pollution one of the top five environmental dangers facing the public. Why is our indoor air so poor? Think about it. Modern day construction has allowed homes to be build “tighter” to conserve energy. However, this “tighter” construction also reduces ventilation. When not enough outdoor air is brought into a home, emissions from indoor sources build up, rather than dissipate. Concerned about your Indoor Air Quality (IAQ)? 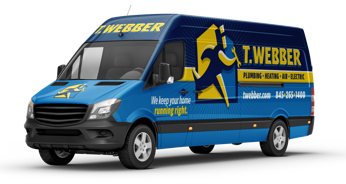 T.Webber can help! Our HVAC Experts can inspect our home, identify the source of any issues, and deliver an affordable solution. Whether it’s installing an air purifier to help trap damaging particles like mold, bacteria, pollen and dander or upgrading your ventilation to ensure clean, fresh air is brought into your home and old, musty air is removed, T.Webber can help. Want to take control of the air you breathe? Call T.Webber today for professional indoor air quality solutions you can trust.